Whether you're dreaming of a wedding that's nautical chic or a bit offbeat, there are lots of Portland, Maine wedding venues to choose from. If you’re getting married in the Pine Tree State’s largest city, you’ll be glad to know that there are many Portland, Maine wedding venues to choose from. 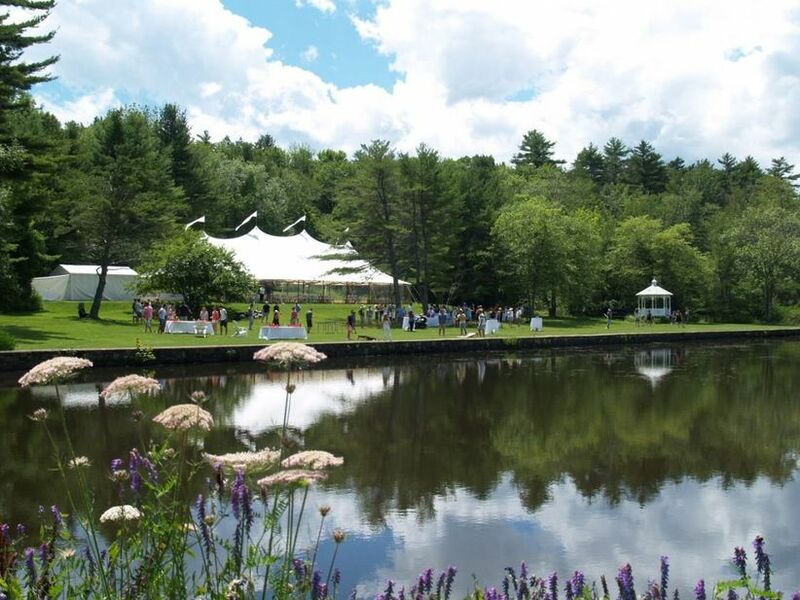 Whether you’re dreaming of a waterfront wedding, desire a trendy, industrial space, or want the convenience and style of a hotel, you’re sure to find it among some of the best wedding venues in Maine. 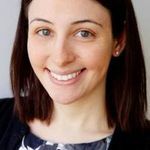 Pro tip: Be sure to have an idea of your guest count and budget before starting to browse Maine wedding venues—you wouldn’t want to fall in love with a space only to learn that the capacity or cost don’t work for you! Check out some of our favorite Portland, Maine wedding venues, from banquet halls to hotels to…bowling alleys? This Portland, Maine wedding venue combines history (it was first built in the 1800s) with modern amenities and industrial style. You’ll love the unique architectural details here, from exposed brick and steel beams to concrete floors, and more. 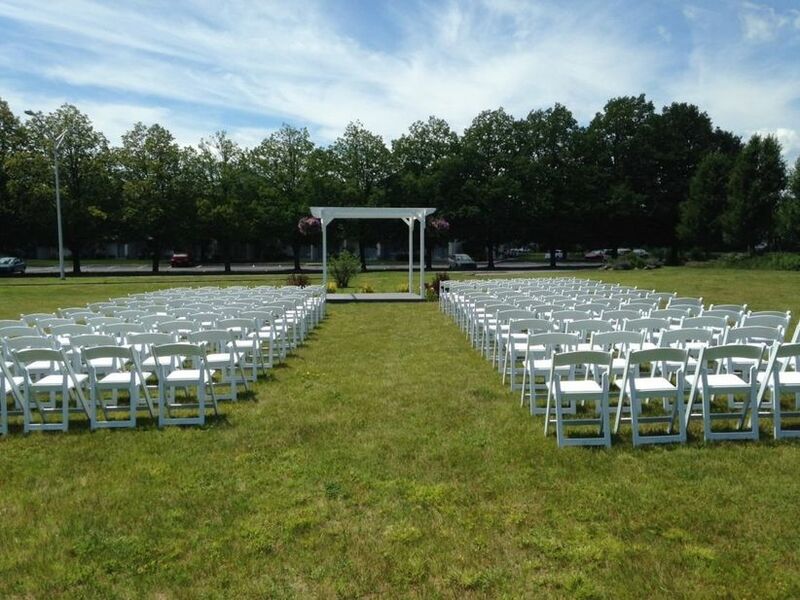 And if you’re looking to host an outdoor wedding on the water, there’s a ceremony lawn on the peninsula overlooking the Fore River. This popular venue includes 25,000 square foot of event space and can host weddings of up to 2,500 guests. Getting married on your own private island may seem far-fetched, but this Portland, Maine wedding venue makes the dream a reality. 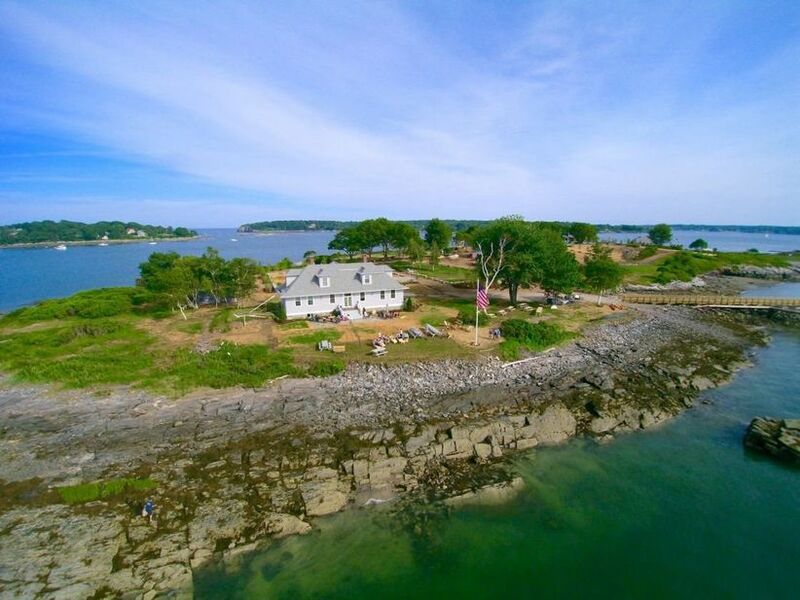 Travel by boat across Casco Bay to this 12-acre island, where you and your friends and family have exclusive access on your wedding day. There are five separate event spaces to choose from, whether you’d prefer a completely outdoor event, a tented reception, or an indoor celebration. There’s room for up to 1,000 guests and the opportunity to totally personalize your day—from flowers to fireworks, which are sure to end the night with a bang! If you’re planning a destination wedding in Maine, it’s ideal to host your wedding at a hotel so that your guests can conveniently stay and party in one place. 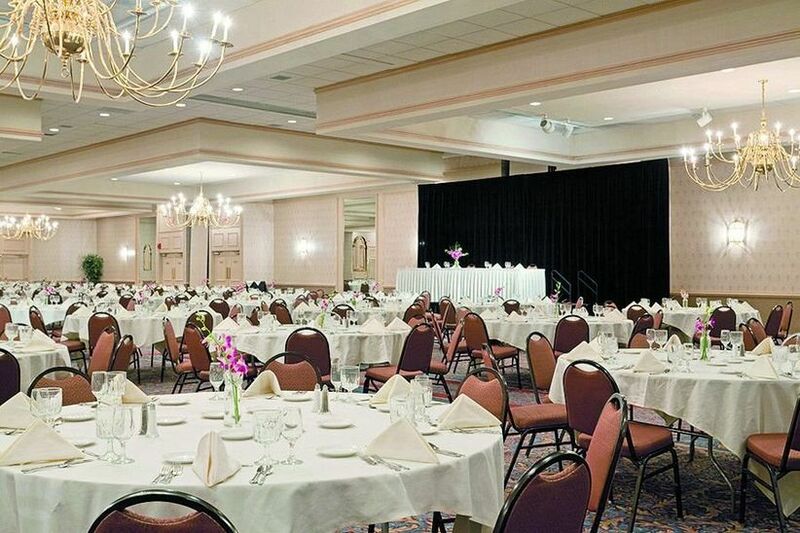 Portland’s Holiday Inn offers a ballroom that can host up to 1,200 guests, and views of Casco Bay. This all-inclusive venue will make wedding planning a breeze, and can host your pre- and post-wedding events as well, from rehearsal dinner to morning-after brunch. 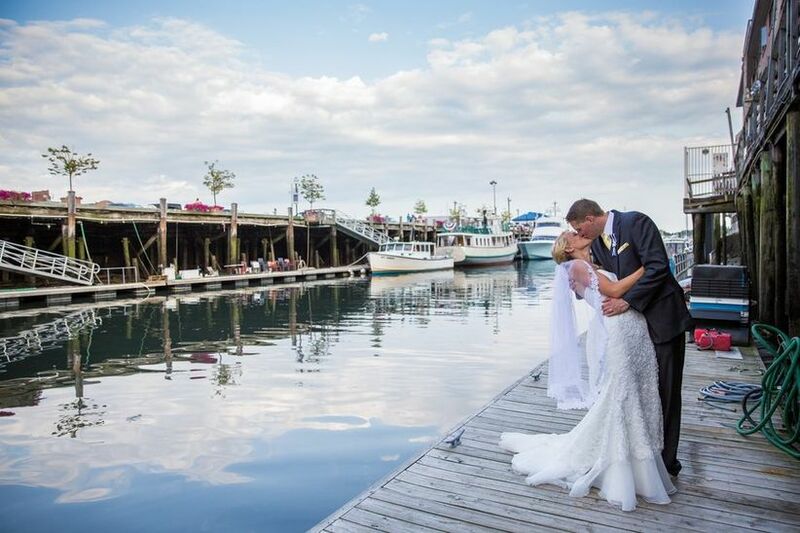 One of the best wedding venues in Maine for a nautical-inspired, waterfront event, this restaurant and marina is a truly special place to host your big day. Wedding ceremonies are held in a gazebo overlooking the ocean, cocktail hours beside a serene pond, and receptions in a Sperry tent on the property. For the true Maine experience, this venue will prepare a traditional Lobster Bake for up to 200 of your nearest and dearest, and other menus and packages are available from this all-inclusive venue as well. 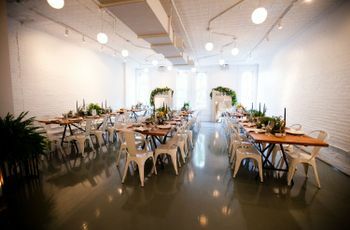 Couples looking for a venue with a vintage feel should check out this historic, centrally-located space. You’ll love the architectural details, straight from the early 1900s, including period millwork, stained glass windows, antique chandeliers, and more. 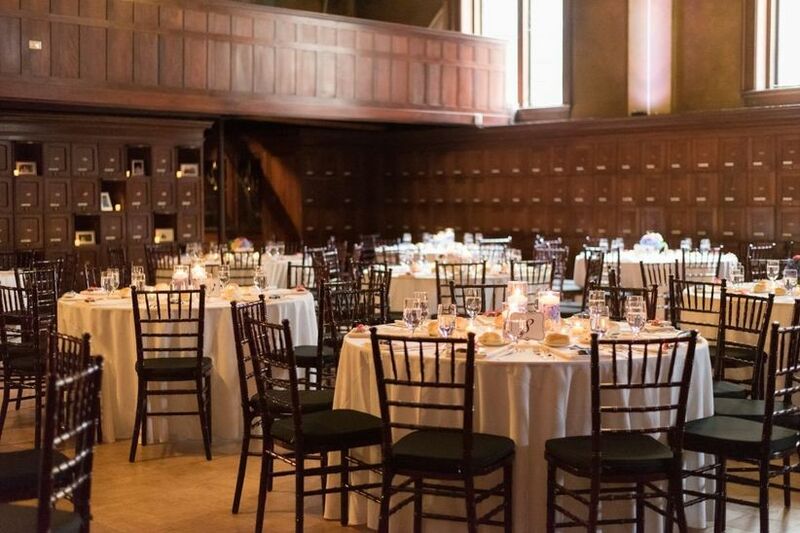 The Reading Room and the Armory are the ideal spaces for a cozy ceremony and reception, with room for up to 220 guests, including a dance floor. The in-house catering team at Blue Elephant Events & Catering will ensure that your planning process is stress-free, with lots of menu options to choose from. This Portland, Maine wedding venue offers both convenience and elegant, classic style. 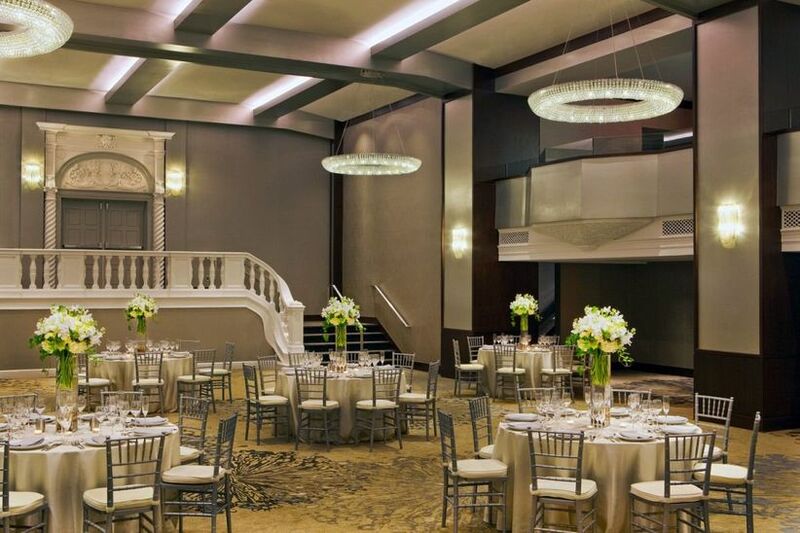 It’s one of the area’s largest ballrooms, with 12,000 square feet of space and a capacity of over 300 guests, though it can be configured to host smaller, more intimate weddings and events as well. And since it’s located within the Ramada Plaza hotel, your friends and family can stay just steps away (plus, you can host your rehearsal dinner and post-wedding brunch at the hotel to simplify planning even more). This Couples’ Choice Award-winning venue wins raves for the food and helpful staff, as well as features like ample on-site parking and shuttle service from local transportation hubs. 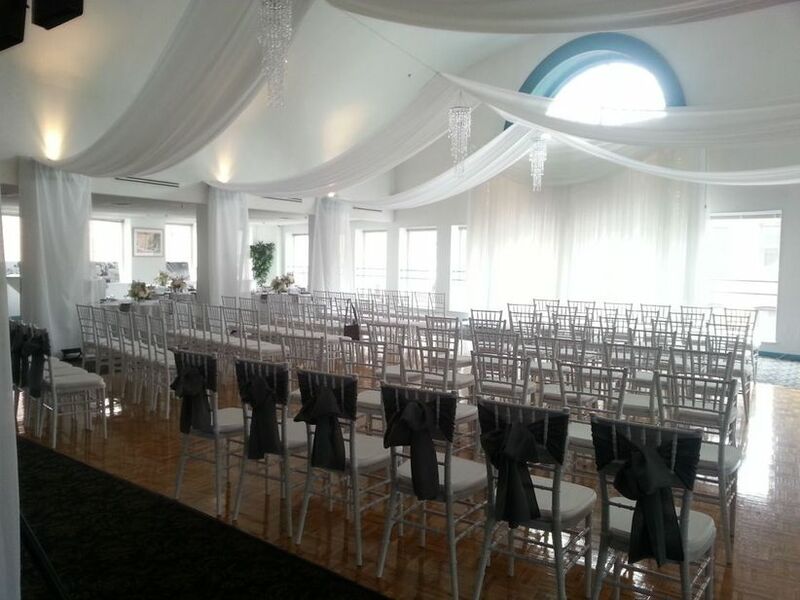 Looking for a smaller Portland, Maine wedding venue? 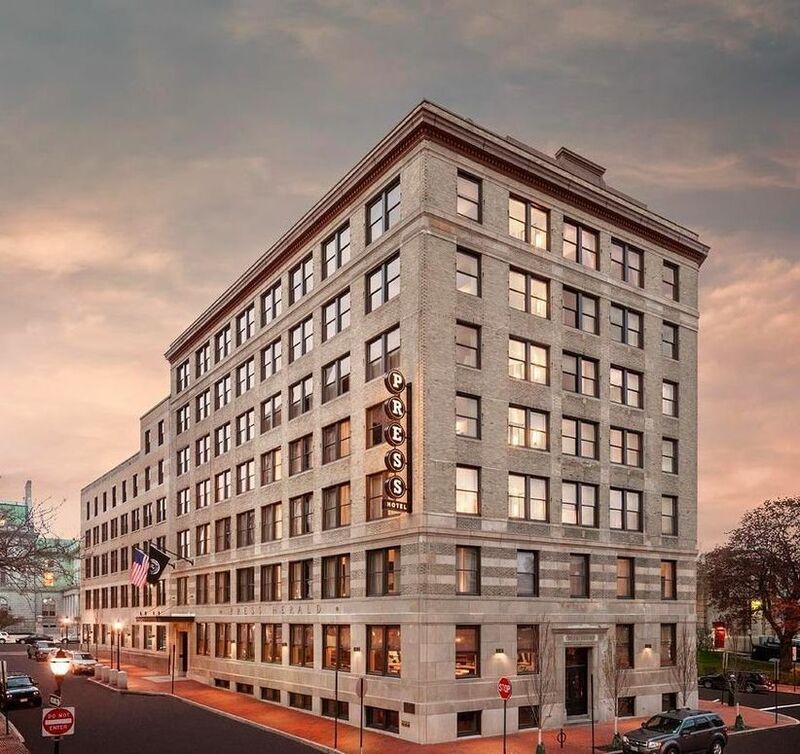 This hotel is located in the former offices and printing plant of the Portland Press Herald, and offers event space for weddings of up to 70 guests for a banquet-style reception. 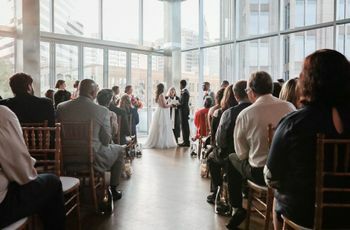 There’s outdoor space for wedding ceremonies overlooking the city, and several event spaces for receptions, the largest of which being the Composting Room, with its large windows and wood paneling. Smaller rooms are available for more intimate receptions or rehearsal dinners. 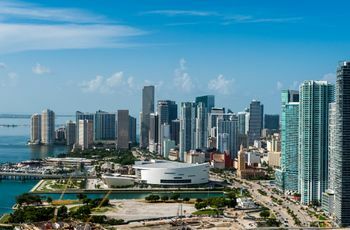 Your guests will love spending your wedding weekend at this unique hotel, and you’ll love the fact that it’s an affordable, all-inclusive venue, with catering, flowers, and more included. 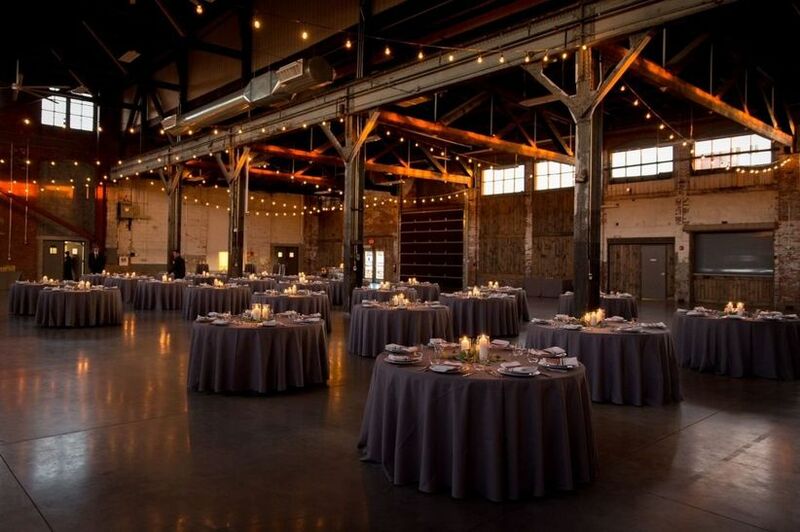 Whether you’re hosting a large or small wedding, this award-winning Portland, Maine wedding venue can accommodate indoor and outdoor events of all shapes and sizes. The Eastview Grand Ballroom is the largest space (with a capacity of 230 guests), with a 1,640 square foot balcony for scenic outdoor space. Intimate receptions can be held in The Longfellow Room or the Winslow Homer Ballroom, with capacities of 100 and 80 guests respectively. Not only can you and your guests stay onsite at this well-appointed hotel during your wedding weekend, there’s also an on-site spa for all your pre-wedding primping! Couples looking for a quirky, offbeat, or retro wedding venue should definitely check out this bowling alley—yes, you read that right! 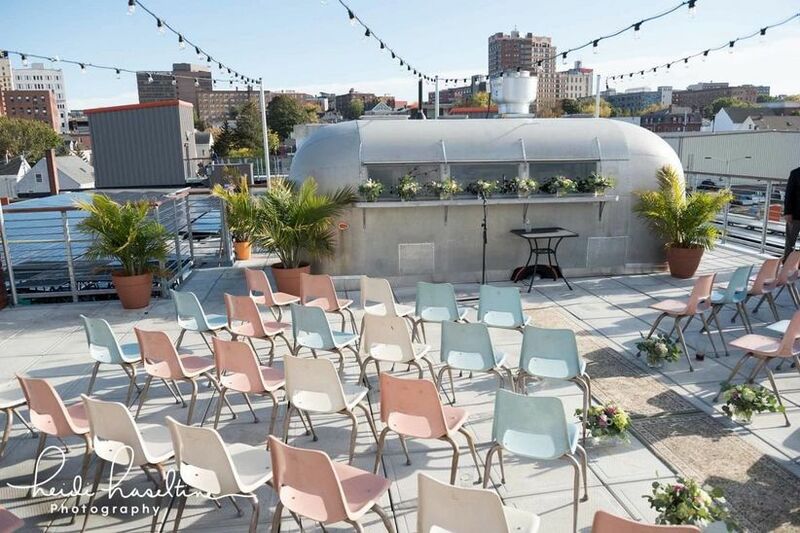 Wedding ceremonies here are hosted on the roof deck with a vintage Airstream and the Portland skyline as your backdrop. Cocktail hours are held in the mezzanine, where your guests can enjoy drinks, bites—and ping pong! And host your wedding reception amid the bowling lanes for dinner, dancing, and maybe knocking down a pin or two! There’s space for up to 500 guests, in-house catering, and, because it’s also a live music venue, ample room for a live band. This Portland venue is also the perfect spot for a rehearsal dinner. 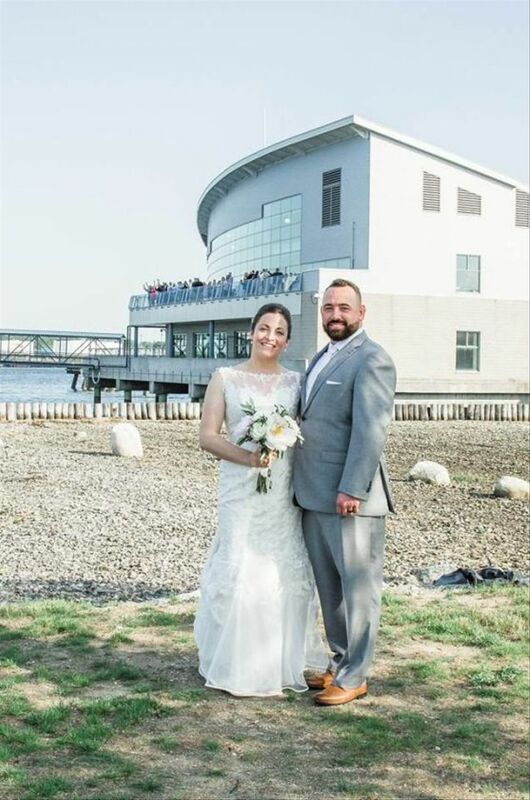 If water views are a must for your Portland, Maine wedding venue, you’ll definitely want to check out this reception hall. It’s a 5,600 square foot glass-enclosed facility built to resemble the prow of a ship, set right on Casco Bay with ample natural light and amazing views. Host an outdoor ceremony at nearby Moontide Garden or inside the Ocean Gateway building, which features steel beams and other industrial-chic details. The facility can host up to 400 guests, and has ample parking—a definite bonus! This Portland collaborative kitchen space is the perfect wedding venue for foodies. 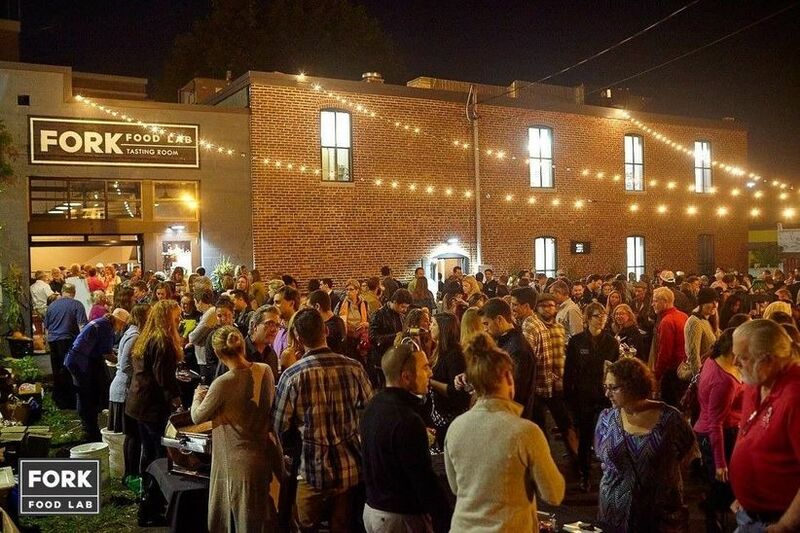 During the day, it houses over 30 small food and beverage businesses, but it can also host weddings and events. 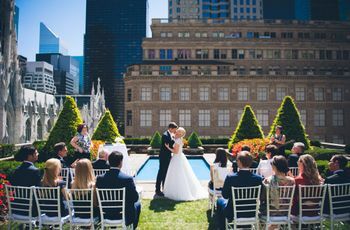 For small weddings, the 40-person Tasting Room is ideal, and for larger events, the Downstairs Kitchen, with space for up to 100 guests, and outdoor courtyard, which can accommodate up to 400, are ideal. This space is also great for rehearsal dinners, showers, and more. Located in the Old Port District, this historic church-turned-reception hall can accommodate up to 220 guests for a seated event. You can host both your ceremony and reception in the airy, light-filled space, and there’s an in-house chef to create a wedding menu to fit your tastes and budget. Couples praise this Portland, Maine wedding venue’s helpful staff and affordability. If vintage style is more your speed, this former church-turned-restaurant is one of the best wedding venues in Maine. 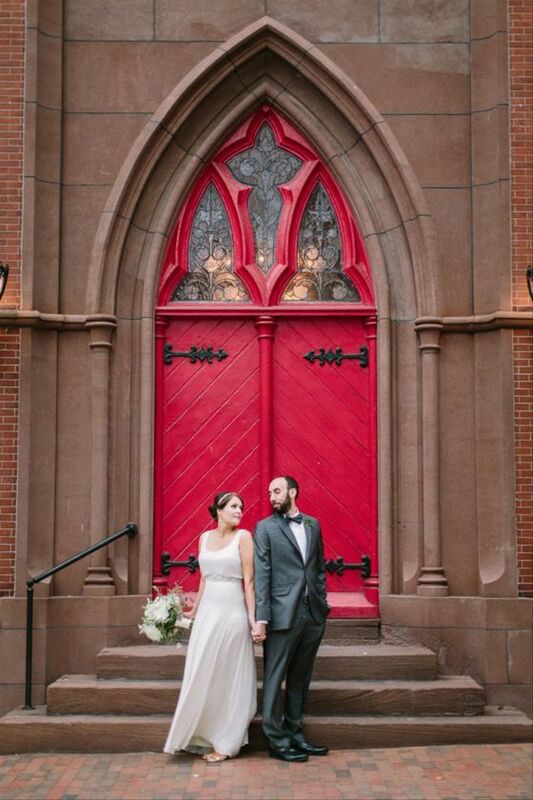 The building maintains many of the original Gothic Revival architectural details from its church days, from the stained glass windows to the cathedral arch work to the grand red entry doors (hello, amazing photo ops!). There’s space for up to 250 guests at this Couples’ Choice Award-winning venue, but smaller events can be hosted in one of the private rooms. This hotel in the Old Port District has a variety of spaces to choose from for your big day. 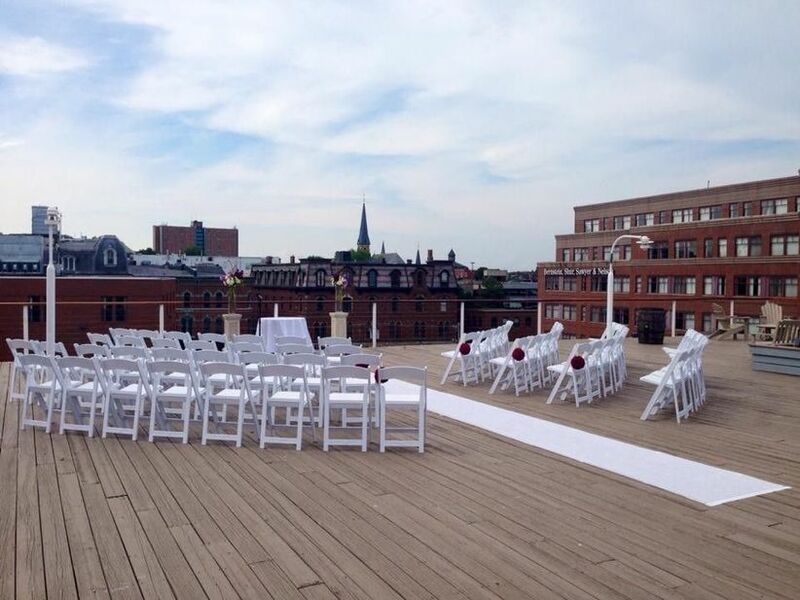 There’s an 8,500 square foot rooftop deck with views of the harbor (ideal for ceremonies! ), the Art Deco-style Atlantic Room with space for up to 200, and three smaller rooms which can accommodate 100 guests each. There are several wedding packages to choose from, and you’ll love the convenience of having your guests stay on-site, plus the fact that there’s a spa on premises!